Orange B is a synthetic red-orange azo dye approved by the US FDA for limited use in processed meat casings. In a study of pregnant rats given Orange B daily throughout pregnancy in their drinking water, when intake was 0.4% of the diet the offspring had higher rates of tissue malformations. Other studies in rats and rabbits have not found effects on fetal development. 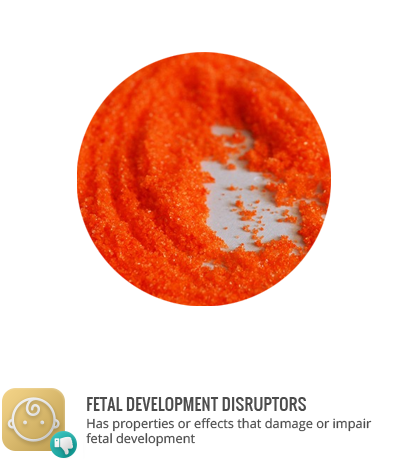 Orange B is permitted at levels no higher than 150 parts per million and is approved only for coloring use in sausage and frankfurter casings and surfaces.